I’ve come to realise I’m one of those people who have a slightly OCD to keep their iPhone in it’s best conditions possible. The slightest dink or blemish on my gear and somehow that’s all I can see when I look at my idevice which seems to get disproportionally bigger with each glance. As much as I try to place my phone down on my desk with care, occasionally in a rush, not as much care is taken as should be. 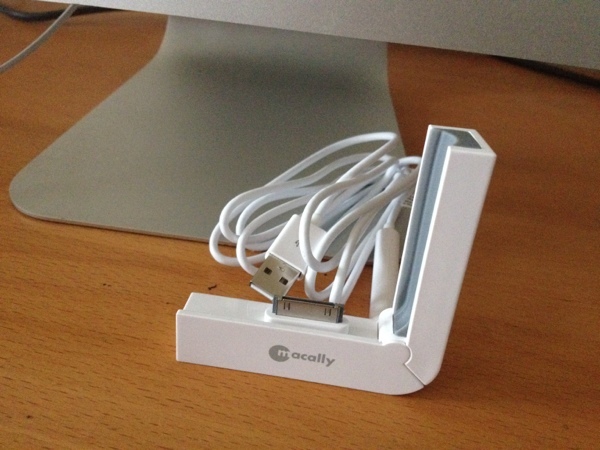 This leads me nicely onto the MacAlly L-Dock which is a portable, Foldable iPhone Synch / Charging Dock. 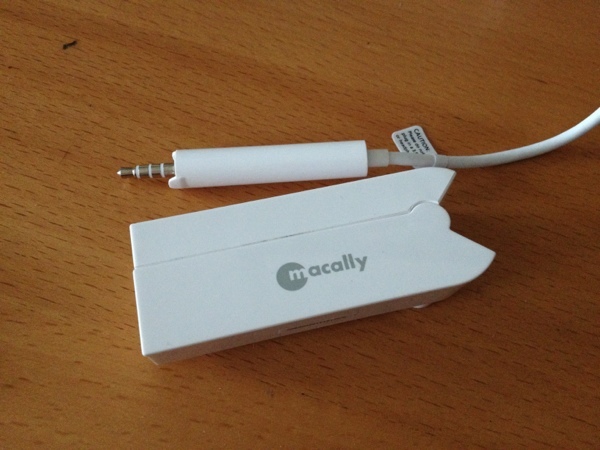 Small, compact and lightweight, MacAlly’s L-Dock is aimed at the portable gadget traveler and perhaps those who aren’t just happy plugging in a phone to charge and slinging their phone down upon their working environment. After all we’ve seen those who eat whilst working through lunch types. Looks wise it wouldn’t be out of place next to the older MacBooks, those makes out of the icon-ably recognisable white plastic fashion. Depending on your point of view it’s a nice, almost retro throw back to the white mac phase or perhaps a tad outdated. Either which way it doesn’t get dirty easily as its a rare accessory which doesn’t attract finger prints the moment you look at it. Weight wise the L-stand it’s practically non existent with the cable almost equalling the weight of the unit itself. On its own it doesn’t stand upright all on its lonesome thus requiring the bundled propriety cable that’s also supplied with the stand. At least the cable is of a decent length coming in at 150 cm long supporting both synching and charing for iPods and iPhones. That special cable plugs in at the back and act’s as a leg for the stand. A touch quirky and there’s no word if you can get a replacement should you leave it at home or at work etc. There’s an obvious nod to the Apple iPhone bumper case as the side support for the case is designed into the edge supporting the side of the phone. Not having a 3GS to test with it’s not hard to imagine the dock connector alone would support that particular device. Theres no faulting the grip this stand has with the phone docked which is just as well as the mainstay of keeping the phone in place. Some rudimentary support is provided on the side which barely touches the phone yet you can tell, even without a bumper case, said case will really fit in with the l-stand. When you’re ready to hit the road the dock closes (and opens) with a satisfying click even if that click does sound just about on the verge of snapping. Good news that after at least an hour of opening and closing, driving everyone mad around me in the process, it’s passed my basic stress / annoyance testing. The lightweight nature to stand also proves to be its biggest Achilles’ heel. Due to its plastic nature whenever you go to press the home button you end up supporting the phone from behind to stop the whole thing sliding away from you. Some non slip grip would especially welcome addition, especially if it’s that stuff you get for car dashboards that stops everything sliding around the place. Quite how handy you’ll find this stand is subjective and each to their own. It’s sturdy enough and more so when used with a bumper case. Those with white iPhones will perhaps be more a target audience. 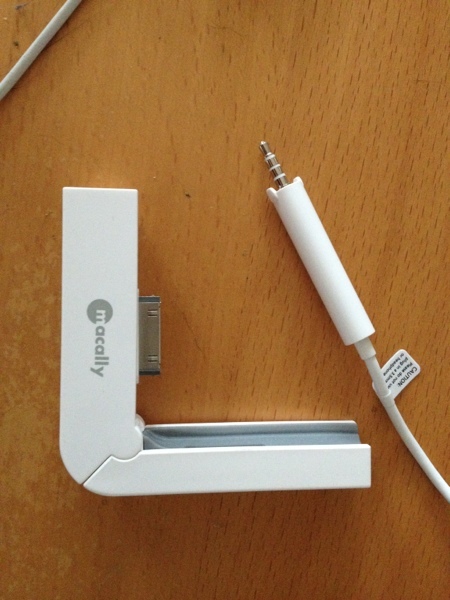 The propriety cable will stop anyone half inching your apple cable (as keeps happening to me) And as its a portable stand you aren’t going to forget to take that cable with you…. Are you. 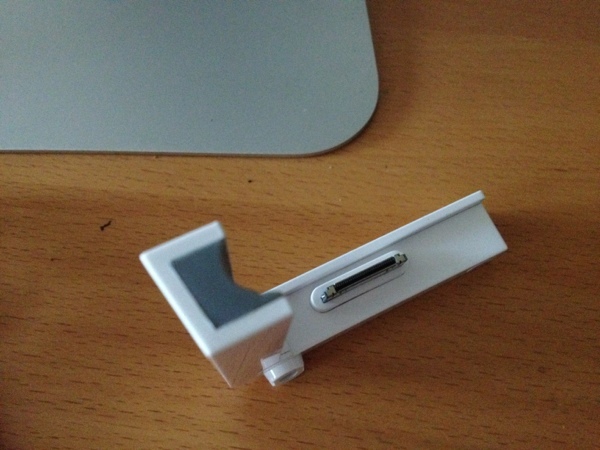 A handy, well constructed stand that could only be perhaps marred by appealing more to the white iPhone owners. 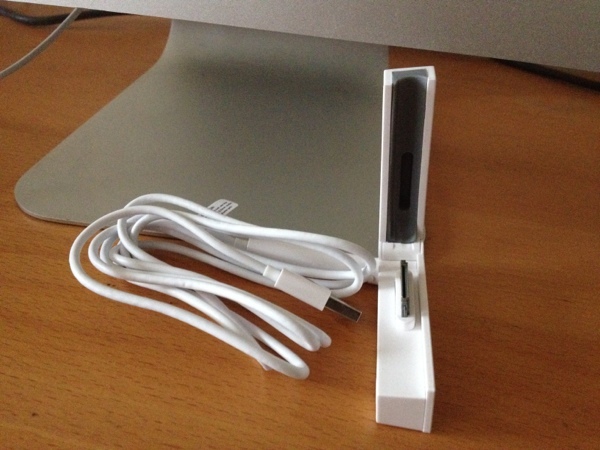 You can get the L-Dock directly from the Macally website. Previous Previous post: So what can you do with a Windows RT, A Stylus And Office 2013?